may want in your Magento store site. 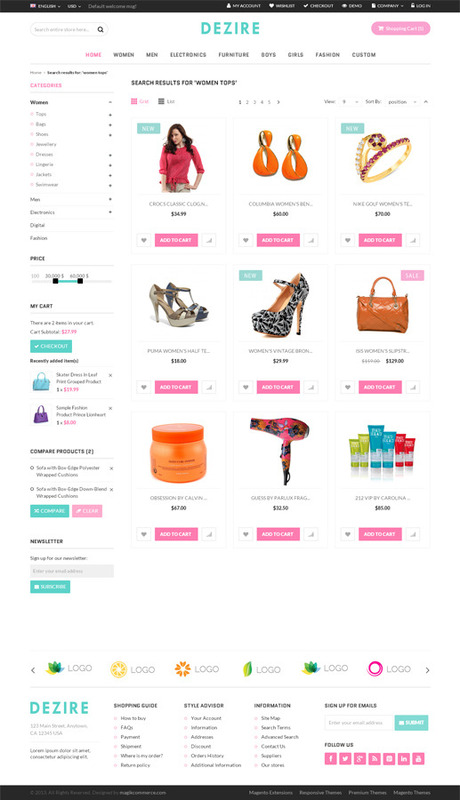 This Magento theme has a instant color configuration that you can use to change the color of your theme. Quickly create the Bestsellers lists that attract and engage your visitors and drive transactions. Grow your list and drive social media marketing via inbuilt functionality within this Magento theme. 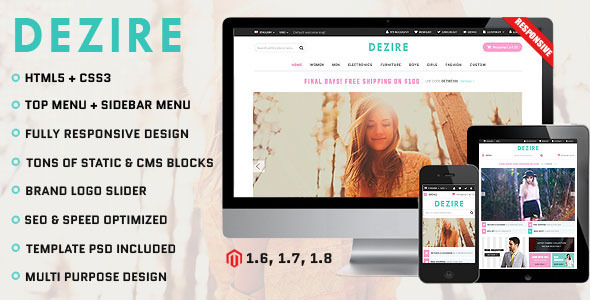 A beautiful and easy to browse list and grid views are pre-designed in this Magento theme. The easiest way to engage your users and have them explore your product catalog without too much thinking. This Magento theme comes with a custom block that you can flexibility use to show additional products, details and any other relevant information. Responsive Design with HTML5 + CSS3: Go with the times! Your store will be adjusted in smart phones, tablets, desktops & many new devices. Custom Slideshow: You can now have a slideshow for your promotions on homepage. Best sellers products: On home page you will get readymade best seller product slider. Integration with Cloud Zoom or lightbox: This option selection will allow you to enlarge product images. Slider for Related Products: Now you can show as much related products as you want. Custom Tab: 2 Custom tab for product page, ready to display product details like info about shipping, returns, sales, etc. Static block for Logo image: No need to upload your logo using ftp client anymore, now you can change logo from admin panel. Product labels: Mark your products with eye-catching labels. “new” and “sale” labels on product page, in categories and on other product listings (editable from admin panel). SEO Friendly: Our theme is using SEO Friendly Design and Layout Structure. It fully support all Magento SEO features. - Minor Fix to contact us form. - Minor modifications in top & left navigation. - Minor fix to social icons. Changed the banner images of theme. - Minor fix in quick view pop up related to quantity increment.